Since Dylann Roof’s 2015 deadly attack on a black church congregation in South Carolina, the largest wholesale rewriting of collective memory in American history has taken place. Despite the tumultuous and violent clashes at Charlottesville in protest of this state enforced amnesia, the disappearance of Confederate history has continued at feverish pace – with some now calling for the ‘Confederate Rushmore’ in Stone Mountain Park Georgia to be dynamited and sent into oblivion and thereby join the hundreds of statues and memorials that have already vanished. It is less well known that Dylann Roof was also sporting the flag of the former rebel British colony of Rhodesia on the day of his attack. No dismantling of collective memory was necessary here, as the story of Rhodesia’s ignominious transition into Zimbabwe had already been thoroughly selectively forgotten. Nevertheless, both the Confederate battle standard and the flag of Rhodesia have now been labelled symbols of hate and white supremacy, earmarked for deletion from history. This process is not exclusive to the United States – in the wake of Andres Breivik’s 2011 attack in Norway, his use of the cross of the Knights Templar and the heraldry of the Crusading Orders was widely reported. It is a much harder task for Europeans to expunge the crusades from collective memory, but a significant amount of state mandated disfavour and public self-flagellation has been duly applied. Now the Templar Cross, the Confederate battle standard and iconography of the Rhodesian state all stand in an eternal limbo – at the very fringes of legal acceptability, associated in the public imagination (if they are remembered at all) only with terroristic mayhem and some vague notion of white supremacy. Yet if they are symbols of white supremacy, they are an odd choice. There are no Confederate States of America. The Crusader Kingdoms of the Outremer have vanished from the Middle East; and Rhodesia and those who settled it have become a mere footnote in history. In short, one could argue in each case they represent white failure, not white supremacy. Yet the eagerness with which governments around the world have attempted to consign these epics of Western history to the dustbin belies a goal beyond simply outlawing hate. They want these stories to go away, because each one represents a counter narrative to the global elites’ carefully crafted world view. One only has to look upon President Emmerson ‘The Crocodile’ Mnangagwa’s rioting and destitute Zimbabwe and compare it to the clean and orderly streets of Ian Smith’s Rhodesia to begin to question the party line that decolonisation was an unequivocal good. One only has to view the eye watering demographic and cultural change that has swept away the ‘Old South’ to gain an inkling into why the Confederacy’s instinctual defence of their way of life may have had some justification. And with every truck and bomb attack an Islamist perpetrates in Europe, the unavoidable conclusion that the Templar Orders were combating an ideology that fundamentally threatens the West seems inescapable. Upon closer inspection, each strand of these complex and heroic struggles reveals something about the nature of Western civilization. They are struggles born from the primordial characteristics of the European spirit: our unbreakable desire to fight for metaphysical ideals, to dream an impossible dream, to defend what is ours at all costs, to rebel against perceived tyranny and injustice; or to sometimes simply revolt against the very material realities of life itself. The Templar did not venture forth simply for plunder and gain but sought to create the Kingdom of Heaven on earth and didn’t fear to die in the process. The Rhodesian wanted to see the desolate wastes of Africa bloom into life and civilization. The Confederate, roused by the inarticulate but gut-felt notion that economic progress and expansive government were about to extinguish a way of life, took up arms to defend his liberty. All made mistakes and perpetrated evils. All were guided by an unachievable ideal and a blind stubbornness in the face of reality. And they were all, ultimately defeated. Some may say these episodes represent a dark cloud in the European psyche – they are tales from the outer rim of Western history, perhaps best forgotten. Yet in forgetting these tales we have also forgotten a crucial emotion necessary for survival: the will to resist. 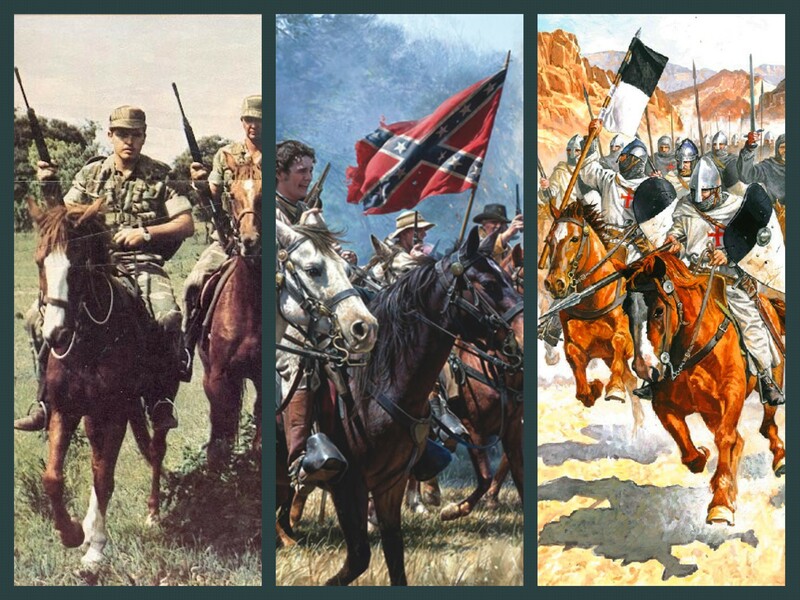 The Templar, the Confederate, the Rhodesian were all prepared to die far from Europe for an ideal, a defence of what they had nurtured and fostered, a divine belief. Now we have no far-flung corners to die in, no colonies or fantastical dreams to defend. Europe itself is under attack by authoritarian rule, demographic replacement, Islamist aggression and spiritual decay. Governments want these chronicles of Western history to conveniently vanish, not because they fear a rise of hate, but because they don’t want Europeans to rediscover their will to resist. Smash through the walls of the historical quarantine zone and gaze upon the mirror of history and you will find looking back at you not outlaws and brigands, but a reflection of yourself and your ancestors. Take a ride with General Lee, relive the Templar’s thunderous charge for glory at the Siege of Antioch, fall into the ranks of the 270,000 Rhodesians who defied a whole continent and global order. Raise your Confederate battle flag, don your Templar cross, listen to a Rhodesian folk song – don’t allow the state to try and steal your heritage and your soul. No matter how many history books they rewrite or mountains they dynamite, they cannot extinguish the European story because it lives on in us. Yet if we do not rediscover our will to resist, that story may have reached its final chapter. The Crusader, the Colonist, and the Confederate are all manifestations of our excesses both of valour and stubbornness. They are a trifecta of the European soul. Learn from their successes and discard their failures, because while they didn’t succeed in reaching their dreams – we must march ever onwards towards our own.